NOTIFICATION: West Bengal Police Recruitment Board (WBPRB), Kolkata inviting online/offline applications for filling up 5702 vacant posts of Constables (सिपाही) from eligible and interested willing candidates. It is latest & good information for unemployed personnel those who are looking for these new Jobs in Government sector & other organizations. Job seekers, who wish to apply for these vacancies regarding West Bengal Police Recruitment 2018, must have passed Madhyamik Examination from the West Bengal Board of Secondary Education or its equivalent with a required experience if asked. Applicant’s upper age should be as per Govt. rules and age relaxation is applicable to all reserved category candidates i.e.SC/ST/ OBC /PWH/Ex Servicemen/Women candidates etc. PLACE OF POSTING: West Bengal. NO OF POSTS: 5702 vacant posts of Constables (सिपाही) in West Bengal Police Recruitment Board (WBPRB), Kolkata. EDUCATIONAL QUALIFICATION: A passed of Madhyamik Examination from the West Bengal Board of Secondary Education or its equivalent. Language: The applicant must be able to speak, read and write Bengali Language. However, this provision will not be applicable to the persons who are permanent residents of hill sub-divisions of Darjeeling and Kalimpong Districts. For the applicant of hill sub-divisions of Darjeeling and Kalimpong District, the provisions laid down in the West Bengal Official language Act, 1961 will be applicable. PAY SCALE: Rs.5400 – 25200/- + Grade Pay Rs.2600/- for West Bengal Police Recruitment 2018 Jobs of Constable 5702 Posts. AGE LIMIT: Candidate’s required age should be in between of 18 years - 27 years as on 01-01-2018. REQUIRED APPLICATION FEE: For said vacancy a non- refundable application fee is to be paid by the candidates as per rules. An amount of 170/- (including Rs. 20/- processing charge) by General & OBC candidates and Rs. 20/- by SC/ST candidates is to be paid through payment gateway by using Debit Cards/Credit Cards/Net-Banking of any Bank. Fees can be paid through different e-wallets also. An amount of Rs. 5/- (Rupees five) only will be charged by the agency concerned as “Service Charge” for availing Debit Cards/Credit Cards/Net-Banking/e-wallet facility. POST RESERVATION: All reserved category candidates i.e. SC/ST/OBC / Women/ Widows etc (as applicable) are being selected for said post/s as per existing Govt. policy/rules. अखिल भारतीय चिकित्सा विज्ञान संस्थान ऋषिकेश ने 217 पदों पर विभिन्न प्रोफेसर की भर्ती के लिए एक अधिसूचना जारी की है। इच्छुक उम्मीदवार यहाँ आवेदन कर सकते हैं। आवेदन करने से पहले पूर्ण अधिसूचना यहाँ पढ़ें । 217 vacant posts of Professor, Assistant Professor, Associate Professor and Additional Professor in All India Institute of Medical Sciences (AIIMS), Rishikesh. LAST DATE TO APPLY: 30-04-2018. 1. Preliminary Written Examination (Marks – 100). 4. Final Written Exam (Full Marks – 85). 5. Interview (Full Marks – 15). 6. Verification of Character (ANTECEDENTS) Certificate. INQURIES: In case of any difficulties in downloading the off-line application form or in submitting the on-line application form the prospective applicants are advised to communicate either through telephone (Contact No. 8013033300 & 8013033322) during office hours (10 AM to 05:30 PM) from Monday to Friday and 10:00 AM to 02:00 PM on Saturdays (except Govt. Holidays) or through e-mail (wbprbonline@applythrunet.co.in). 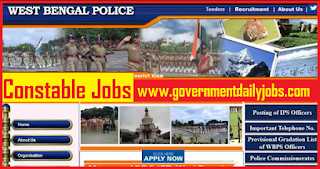 HOW TO APPLY: For said posts (WB Police Recruitment 2018 || 5702 Posts of Constable Apply Now) eligible, willing and interested candidates may apply through online/offline mode at official website up to last date. Applicants must retain a hard copy for future reference. The last date of receipt of filled in Application Form through postal services (for off-line applicants) is 02-05-2018 (5 PM). CONTACT ADDRESS: West Bengal Police Recruitment Board (WBPRB), Araksha Bhaban (5th Floor), Sector – II, Salt Lake City, Kolkata – 700091(WB). CONCLUSION: West Bengal Police Recruitment Board (WBPRB), Kolkata invites online/offline application for the recruitment of 5702 vacant posts of Constables (सिपाही) on regular basis from Indian residents who are eligible & interested; candidates can apply through online/offline application. LAST DATE TO APPLY: 30-04-2018 for WB Police 5702 Male Constable Posts Govt Job | West Bengal Police Jobs.